Beyond the cemetery gates of this historic cemetery, opened in 1866-67, the visitor discovers row upon row of white headstones, all of which are lined up in military precision. Each is inscribed with a soldier's name and regiment, and each one of them has a story to tell. This book was created to tell the stories that were discovered after compiling data from years of research utilizing a multitude of resource materials. 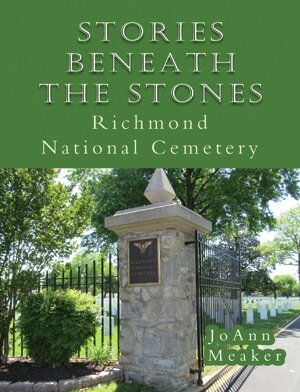 It is a valuable tool for researchers, family members, and those with an interest in the Civil War and in cemeteries in general. Autographed copies are available - contact me for your copy. My children's fantasy book... available on ﻿Amazon﻿ and Kindle. Young Nola is sent on a mission to find beads of the jewelfern. Lady Marika, the village healer, needs them to create a potion that will help heal the children stricken by the strange illness that has swept their village. On her travels, Nola discovers the dangers of the forest, and children with unusual abilities. Will she be able to gather the jewelfern in time? Learn what happens to Nola that will change her life forever. Contact me for an autographed copy of Nola's Gift - $7.50 including shipping. A Line of Shorts, is a collection of heartwarming stories for readers of all ages. This buffet of tales spans the years from the time of the Civil War to the present ranging from fact to fantasy with characters dealing with relationships both good and bad. To get your copy - click HERE. Or for an autographed copy, email me (jomeaker@yahoo.com). Only $7.50 including shipping. Four Branches is available on Amazon.com, the Kindle Store or contact me directly for an autographed copy (cost is $12.50 per book including tax and shipping). From the back of the book: Following the main characters from My Dear Emma, we learn about Rachel and her daughter who embark on a pleasant country drive to research her ancestors when a sudden storm drives them in an unexpected direction. Stranded and alone, an isolated cabin seems to offer refuge, but within those timbered walls more threats await. Rachel’s troubles in the present are woven together with a family embroiled in the Civil War and the lives they touch on their journey to freedom. Lives are imperiled, and a dawning realization changes Rachel’s life forever. One reader says of Four Branches... "Dual time lines skillfully woven together draw readers into the action-filled story. And true details from Four Branches of the author’s family tree provide a sound basis for this compelling work of historical fiction." If you are interesting in a personalized, autographed copy, contact me. (cost is $12.50 per book including tax and shipping). It’s 1862, and the Civil War is raging. Hearing the call, James enlists and, leaving his family behind, musters in to the 10th NY Volunteer Cavalry. Flash forward one hundred and fifty years. Rachel Benton is desperate. After the sudden death of her husband, and eviction from her house, she is forced to move across the country with her young daughter, Julia, to a small town of Oxford to take care of Nonna, her ailing grandmother. When her grandmother dies, she finds herself immersed in the legal ramifications of handling her grandmother’s estate. As she searches for Nonna’s will, Rachel discovers Civil War diaries and letters and other mysteries hidden in the house. Who are James and Emma? How will their lives impact hers? Will she find the answers before time runs out? My Dear Emma is available at Amazon.com. My Dear Emma is available in Kindle e-book version. Don't have a Kindle. No problem... there's a way to download an app to be able to read a Kindle book in other formats. Check HERE. Published in 2007, this book was written for the town's bicentennial celebration. Working with town Historian, Liz Albright, I gthered together a variety of photos depicting the town's rich history. Find out about the Iron Ore Mining industry - and how a piece of land went from Apples to Atoms. Published by Arcadia Publications this book can be found at their website, at Amazon.com, at Barnes and Noble.com or contact me for a personalized, autographed copy. Anthologies: I have be asked to be a part of four different anthologies. I was recently interviewed by a fellow writer, and am now featured on her blog.Check it out HERE.